Have you got our new App? We are proud to announce Ireland’s first Courier App is now available for both Apple and Android mobile phones. Nearly three quarters of our customers book couriers on a mobile device. Now, using that same device, they can not only book but also pay for it using the App, without the need for a Deadline account, making it very useful for one off collections and deliveries across Dublin. This Deadline App, in a similar fashon to the MyTaxi App, will allow you to book and pay for a courier, specify a time for collection and delivery either same day or direct. When your personal courier arrives, and you will know your couriers name too when they arrive to collect your goods, you will sign electronically as the package is collected. The App will show you the route the courier will take, and you will get a text or email when your parcel is delivered and the signature of the person who took delivery. This App is for busy people who don’t want to sign up to a courier account – everything is done on your device transparently, quickly, easily and safely. 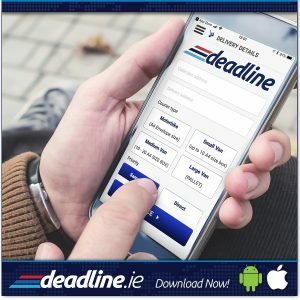 Since its establishment in 2010, Deadline, has become an established brand in the Irish transport and delivery industry. The business has grown to provide many specialist support services across national and international boundaries, including specialist deliveries for the legal, medical, construction and engineering sectors. By Webmaster|2017-12-08T08:40:01+00:00December 8th, 2017|Deadline Services, General|Comments Off on Have you got our new App?